Members of the contemporary musical ‘The Sound of Music’, by British composer Andrew Lloyd Webber and David Ian’s Really Useful Group, spoke to ARTRA about certain dynamics regarding the production and rehearsal process of the drama. Cinnamon Life together with David Ian Productions Ltd, Company Onstage Ltd and the Broadway Asia Company present the much-awaited performance will take place on the 14th - 18th of February. 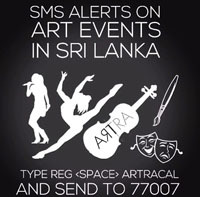 Notably, this international cast will perform the musical for the first time in South Asia, moving from its point of origin on the stages of Broadway and the West End to the Nelum Pokuna Mahinda Rajapaksa Theatre space in Colombo. The implementation of technology in theatre practice has had a growing influence in certain distinctions ranging from the invisible presence of the computerized stagehand, the immersive nature of audio quality and the dynamism of lighting. In some ways, Carmen Pretorius, the South African actress playing the lead role of Maria Rainer, relates, “it has made my job as an actress easier, and in some ways a little more challenging”. Much of theatre production has had elements of its constructive methodologies fundamentally altered by the increasing determinations of digital technology, yet still maintains a sense of integrity as a practice relative to its traditional roots of the live acting of human performance. Aspects of costume design, makeup and the construction of all these factors have been determined by developments of both analogue and digital technologies, the effects ranging from the practical ease of transport, setup and instant communication online, to the creative discourse inherent within the fields of art, illusion and stagecraft. Presumably, the more advanced the technology the simpler the task at hand would be to manage. However, Carmen notes, particular issues exist, as the majority of devices are programmable and computerized; an outage would make resumption of the performance a potentially difficult task.